TITUSVILLE -- For 30 years, residents of Florida’s Space Coast looked to the heavens for their livelihoods and took pride knowing that it really is rocket science to successfully send a fleet of space shuttles to and from Earth. 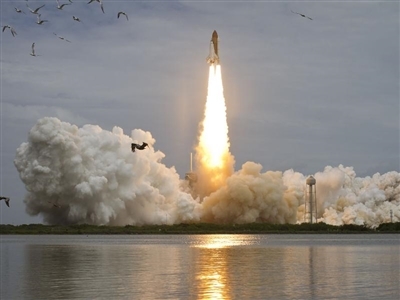 Space shuttle Atlantis lifts off in the final flight of NASA's shuttle program July 8, 2011, rocketing many workers and families into economic crisis. NASA photo by Bill Ingalls. Gone are the days when shuttles like the Atlantis, foreground, and Endeavour, occupied launch pads at the Kennedy Space Center. NASA photo. But in the 24 months since the shuttle program officially ended, many have lost their livelihoods and more. In response, churches across all denominations have reached out to the Space Coast to show Christians they don’t need a shuttle to grow closer to God. “Our message and our ministries have emphasized that, yes, that’s changing but God never does. Here’s an opportunity to turn more fully to God,” says Rev. Bill Corristan, senior pastor of Indian River City UMC, Titusville, where an estimated 40 percent of Kennedy Space Center employees live. Florida’s Space Coast generally extends from Titusville through Rockledge and Cocoa down to Palm Bay and Melbourne, most of which is Brevard County. In addition to NASA's Kennedy Space Center, Brevard is home to Patrick Air Force Base, which launches the U.S. military's unmanned rockets from Cape Canaveral Air Force Station. By comparison, 32,000 people worked at the Kennedy Space Center at the height of the space shuttle program in 1991. By 2008, that number declined to little more than 14,000. Of those, nearly 9,000 jobs were related to the shuttle program. Space center employees were customers of other businesses, and economic impact studies indicated NASA and its shuttle program generated 40,800 jobs, $4.1 billion in economic output for Florida and $2.1 billion in income. 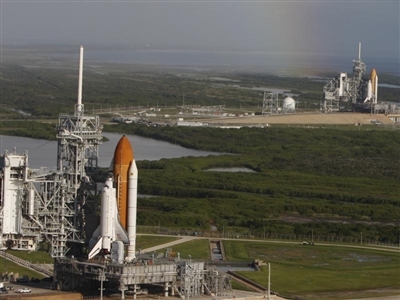 All that changed in July 2011, when the shuttle Atlantis returned from its final mission. The sporadic downsizing over the years culminated in one day when approximately 8,000 people lost their jobs at Kennedy. Estimates put the region’s total job loss at up to 25,000 when factoring in retail, hotel and restaurant jobs that depended on the shuttle program. Churches did not escape the downward ripple effect. Membership initially declined as people relocated for work. And there was increasing demand on church resources. Georgianna participates in House of Hope, a food and clothing cooperative ministry with the local First Baptist Church and Calvary Chapel Merritt Island. When the ministry began in the mid-1990s, it served about 330 families each week. Now that number regularly surpasses 1,000, says Cal Burch, House of Hope director and a 27-year veteran of the Kennedy Space Center. 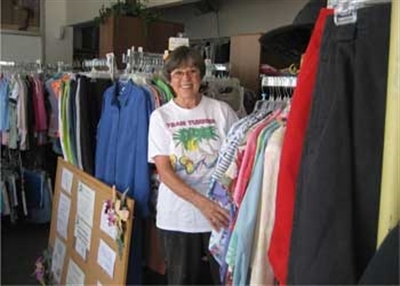 Audrey Cottrell, clothing boutique manager at House of Hope, shows some of the apparel available for free to those in need in hard-hit Brevard County. Photo from House of Hope. The region-wide belt-tightening forced many small businesses to close, as former NASA employees could no longer afford lawn and cleaning services, non-essential shopping or dining out. So Georgianna asked members to identify people in need. “We tried to be really intentional and create avenues of encouragement for those losing their jobs,” Calhoun says. 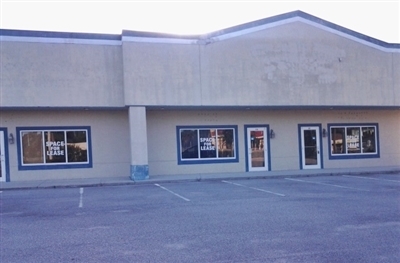 Similar outreach occurred in Titusville, where churches across all denominations had already partnered to create The Joseph Fund in anticipation of widespread economic downturn. As the Bible’s Joseph, son of Jacob, organized stockpiling efforts to prepare Egypt for seven years of famine, Titusville church leaders structured the community fund to help families affected by layoffs, Corristan says. 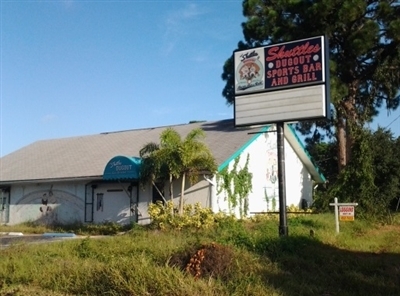 Loss of a strong identity as Florida's Space Coast has led to closed businesses such as the Shuttles eatery in Merritt Island, above, once heavily patronized by space program employees. Below, "Space for Lease" signs replace former space-themed business signs at this commercial complex. Photos by Colleen Hart. Other challenges included anger and grief over losing something that had been an integral part of regional and personal identity. Tourist maps with cartoon shuttles to denote the Space Coast are being redrawn, and job seekers with the singular experience of launching space shuttles struggle to make their resumes relevant to other careers. Several churches offered one-on-one counseling or deployed laity “shepherds” to help people find healthy ways of coping. Georgianna UMC brought in grief counselors to conduct two daylong sessions. Yet, amidst the hardship, hope and spiritual renewal has persevered and even flourished. Several churches report an increase in membership as many people return to the church or join because of the Christian love and outreach they experienced. Even for churches where regular tithing suffered because members lost jobs or relocated, congregations came together to find creative ways to help others. “At the holidays we offer ‘brown bag blessings,’ in which we put together a grocery list of essential items that the church members purchase and donate,” Corristan says. Job loss even proved an ironic blessing as the unemployed spent newfound free time volunteering in outreach ministries. Cooks, painters, construction workers and even former space center engineers have logged volunteer time at House of Hope, Burch says. Across the Space Coast, church leaders say adversity has strengthened community bonds and underlined the biblical lesson of the widow’s mite. -- Colleen Hart is a freelance writer based in the Cocoa area.